Before the city appropriated funds for the secondary education of colored children, high school instruction was given at the Colored Normal School. This school was in operation as early as 1873, with Rabza Morse Manly as principal. ( Rabza , Armstrong’s student yearbook, is named for him.) City-financed secondary education for colored children began when the Richmond Colored Normal School became a part of the public school system. After the Normal School’s building at 12th& Leigh Streets was condemned for school purposes in the 1908-09 session, the high and normal programs were relocated to the former Leigh School at the corner of First & Leigh Streets. 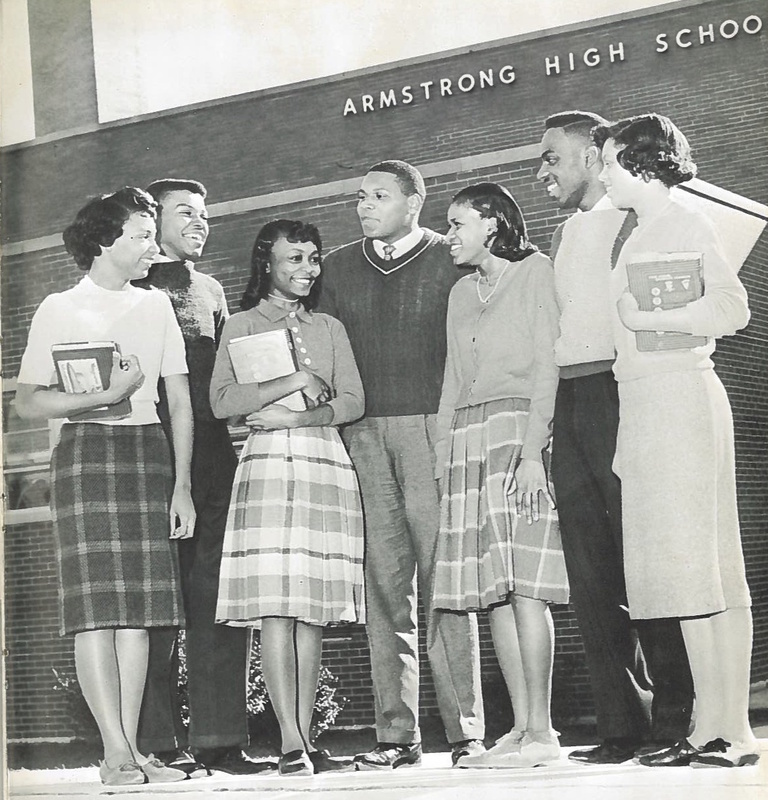 At this time (1909 ), the name of Richmond’s first colored high school was changed to Armstrong to honor General Samuel D. Armstrong (1839-93), the noted educator and founder of Hampton Institute. In 1915, the all-white faculty was replaced with colored teachers, reportedly five men and ten women. The July 1920 annual report states: “A five-room annex will be completed this summer.” This was used for shop work, domestic science, and sewing classes. The new building was immediately crowded. Additional land was purchased in 1925-26 and again in 1929-30. By the 1926-27 session, Armstrong had outgrown its new building, necessitating part-time classes. This situation was relieved in 1928 by the completion of a 21-room addition at the rear which housed domestic science, art, wood, shop, and other classes. The auto mechanics shop was enlarged in 1935-36, partially funded by a W.P.A. grant. In 1936, it was reported that Armstrong was on double shift for the fifth year. The facilities continued to be taxed, even after the City opened a second colored high school in 1938 (Maggie L. Walker). For 41 years, the Armstrong-Walker Football Classic was an annual event on the Saturday after Thanksgiving. After 1940, Armstrong also used Monroe Center, across Leigh Street, and (following World War II) the Monroe gymnasium. Once again, Armstrong’s new quarters were immediately crowded, subsequently leading to the use of modular classrooms and a system of staggered openings/closings. Elementary schools were soon forced to retain the seventh grade, and the eighth grade was diverted to the East End building when it became available. Renovations in 1966 enlarged Armstrong’s kitchen and cafeteria; a two-phase air conditioning program was carried out in 1969 and 1982. In October 1980, the School Board granted the request of the East End Think Action Committee to name the Armstrong gymnasium for an Armstrong graduate and long-time coach, the late Maxie Cleveland Robinson. In 2004, Armstrong was combined with John F. Kennedy High School, and moved to the JFK building at 2300 Cool Lane. Thank you for posting this! What a history. A history so great they are going to tear it down to build apartments. So so sad the first black high school in the City of Richmond.